In 7 minute mark of this lecture, the Sri Vaishnava lecturer U. Ve. A.S. Rajagopalan Swami explains the importance of Sharanagati, or complete surrender to Vishnu as a means of getting Moksha, using the analogy of a father-son relationship. So the connection that is already there, father-son relation, but the son is doing all the trespassing of the Vedas and everything, father is getting angry, and what can you do? You can go and tell the father, “Don’t worry about any of those things, excuse everything, and give Moksha for everybody?” Who are you to tell? And he’s not going to listen if you say. Even Parashara Rishi told “Give Moksha to everybody.” He didn’t give that. So what else can you can do? You can go to the [Jivatma] and say, “Why don’t you do something to attract your father, so that you can enjoy that?” So the most interesting concept in the Visistadvaitam, Swami Desika says, is [Sharanagati]. I’m interested in the part in bold. My question is, what scriptures describing the Rishi Parashara, father of Vyasa, asking Vishnu to give everyone Moksha? Parashara is the author of the Vishnu Purana, so perhaps the Vishnu Purana contains this request. On a side note, Vedanta Desikan cites this verse in this excerpt from his Rahasyaratnavali Hridayam as an example of someone performing Sharanagati on behalf of someone else. 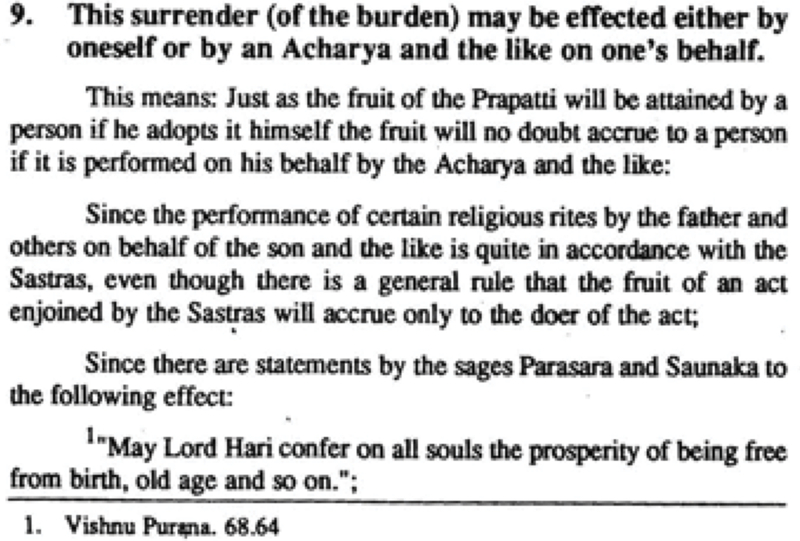 So that means that Parashara performed Sharanagati on behalf of all the Jivas in Samsara. Thanks Parashara! Not the answer you're looking for? Browse other questions tagged mythology vaishnavism sri-vaishnava rishi vishnu-purana .